When I was a little girl I loved to roller skate but when I tried to ice skate it didn't work out quite like I hoped. Granted I only got to try a handful of times but I thought it would be easy...wrong! I loved to watch ice skating in the Olympics though. 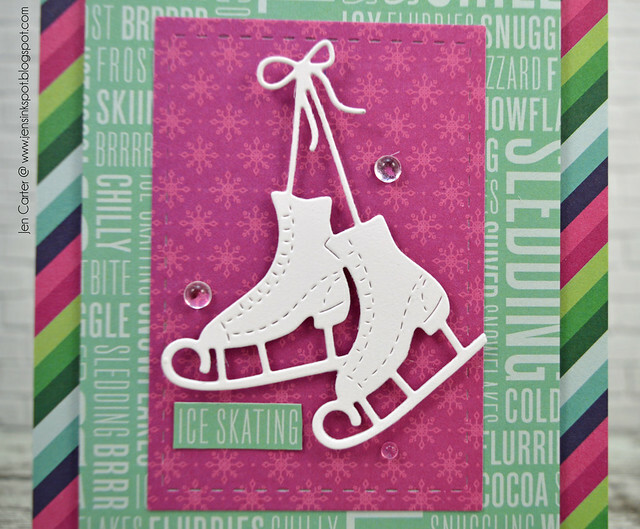 I like this Hanging Skates die and all of the details in it as it reminds me of some special memories from childhood. The purple panel that the skates are adhered to (with dimensionals) was die cut with the Elementals 1 die set. I added some clear rainstones to mimic ice. Welcome to the Cupcake Inspirations Challenge #392! This week the challenge is to use plaid on your card. All of the details, including prize information, can be found on the Cupcakes Inspiration blog. I hope you'll be able to play along! This week our sponsor is Gerda Steiner Designs. The inspiration photo this week is one of my favorites yet! You don't have to use the photo as inspiration as long as you use the theme for the week but I decided to for this card! I started by die cutting a heart that stitches the outside of the heart (a feature I love!) called Stitched Hearts. I then popped the panel up with dimensionals for the plaid to show through underneath. 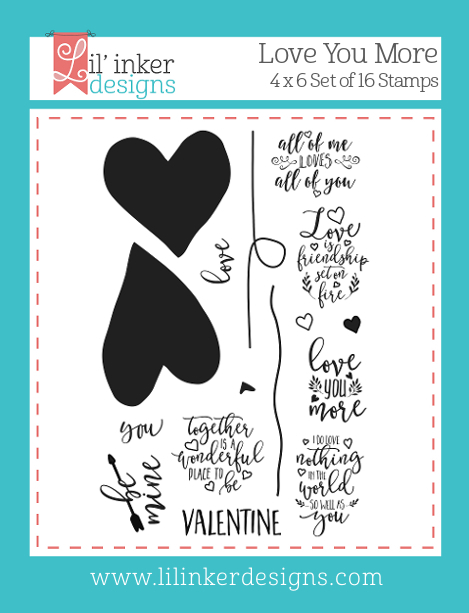 I die cut the Love from a set called Brush Script Valentine's Day Word Dies and added some enamel dots. The theme this week is "plaid". You can choose to use the cupcake graphic for inspiration if you'd like but you don't have to, as long as your card or project fits the theme. 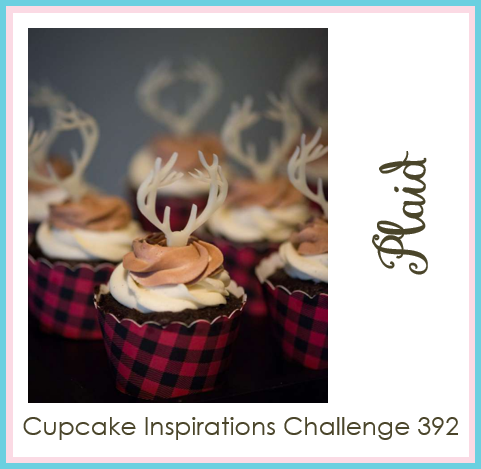 I hope you'll join us this week for the Cupcake Inspirations Challenge #392! Thanks for stopping by! Hi! I realized I never shared this card in its entirety so I wanted to share it today. This card is made with the most adorable little die set called Kokeshi Japanese Paper Doll! There are tons of different options for creating the cutest little paper dolls! I had so much fun making these two adorable girls! The sentiment, from Asian Inspired Sentiments, is stamped on vellum die cut with the Double Fishtail Labels die. The stitched panel that it is all adhered to is die cut with the Elementals #16 Stitched Rectangle Frames die. Here's a closeup of the adorable dolls! Thanks for visiting today! Have a wonderful day! Hey everyone! I have a card to share today that is love/valentine themed. I started by using Zig Markers to create the watercolored background. 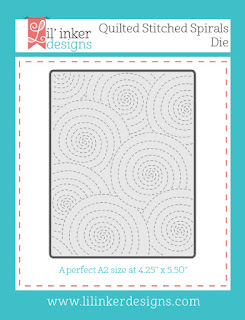 I die cut the watercolor paper with one of the Silly Stitched Dies. The heart balloons were die cut with the Love You More Hearts & Balloon Die Set and then the sentiment is stamped with the Love You More Stamps. 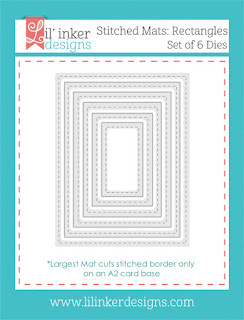 That fun die cut border is the Love You Much Border Die that can be used for so many different occasions. 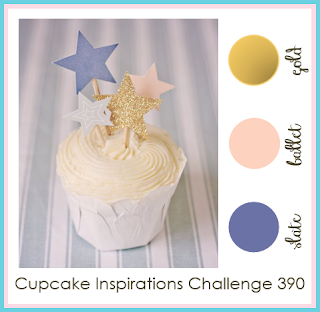 Welcome to the next Cupcake Inspirations Challenge #390! This week the challenge is to use the provided color scheme (shown below) on your card or project. Our sponsor this week and the prize is from Lawn Fawn. All of the details, including prize information, can be found on the Cupcakes Inspiration blog. I hope you'll play along! I used Lawn Fawn's Flying By stamp & die set to create the paper airplane. 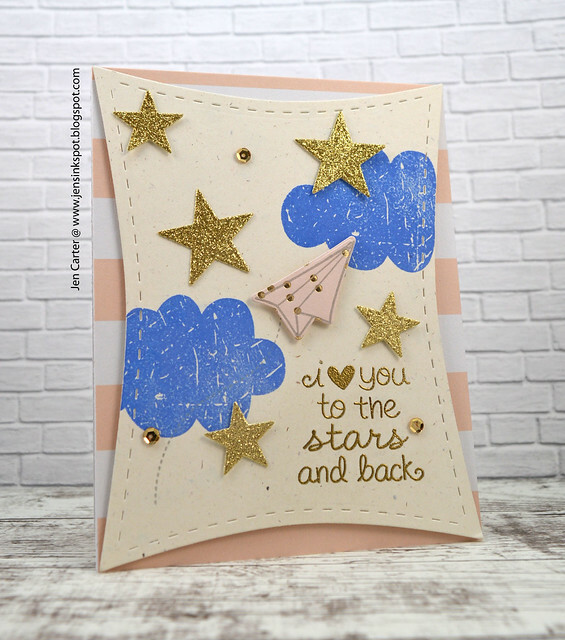 The gold embossed sentiment is from a fun set called Lucky Stars. I cut some glittery stars with LID's Stitched Stars. All of that was adhered to a mat I cut with LID's Wonky Rectangle dies. My blue clouds aren't exactly the right ink color but it was the closest I could find. Here is the color scheme. I hope you'll join us this week for the Cupcake Inspirations Challenge #390! Thanks for stopping by! Be sure to comment on all of the Design Team blogs so you are eligible to win a BIG prize from Lil' Inker Designs this month! For my first project today I have a fun (and easy) Valentine's Day idea for you. 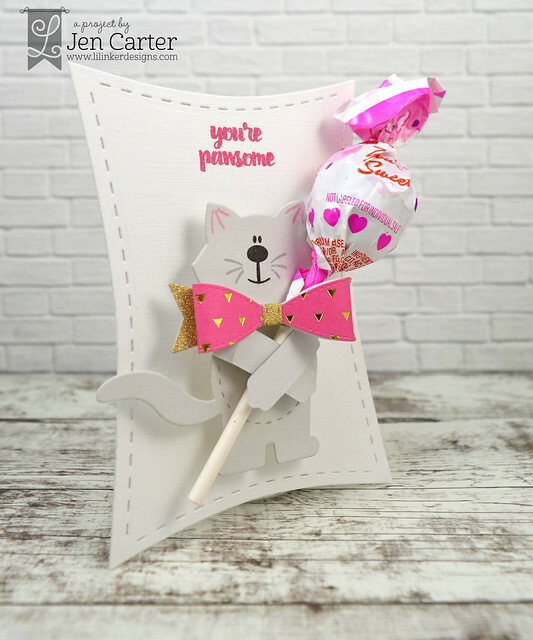 I've used the Kitty Hugger Die Stamp Bundle to create this adorable little cat. The face, whiskers & ears were stamped using the stamps that come in the bundle. 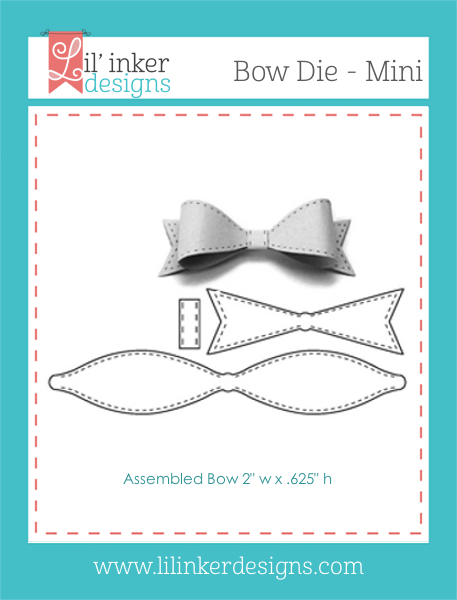 I added a super cute bow that was die cut with the Bow Die Mini. I love using this little die to add a little extra "something" to projects and it fits this cat perfectly! I stamped a sentiment from the bundle onto a Wonky Rectangle die cut base. This would make adorable valentine favors for school, neighbors, friends and family! Since the sucker is so bulky, I needed to add some extra dimensionals behind the cat to help her stand out from the card base a little. Here's a look from the side. 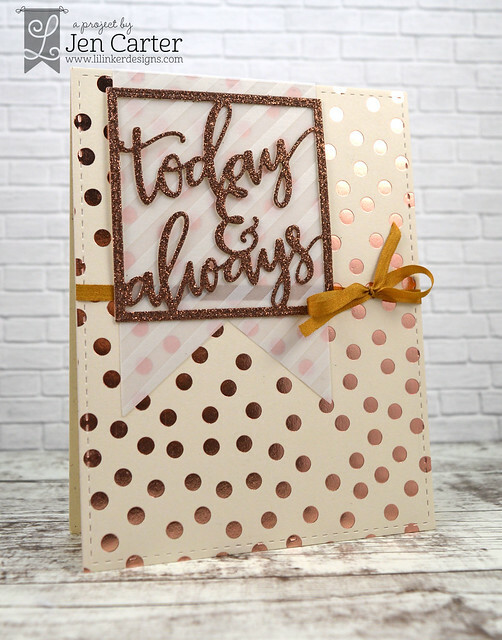 My last card is a gold foil dotted wedding card using the new Today & Always Greeting Die. 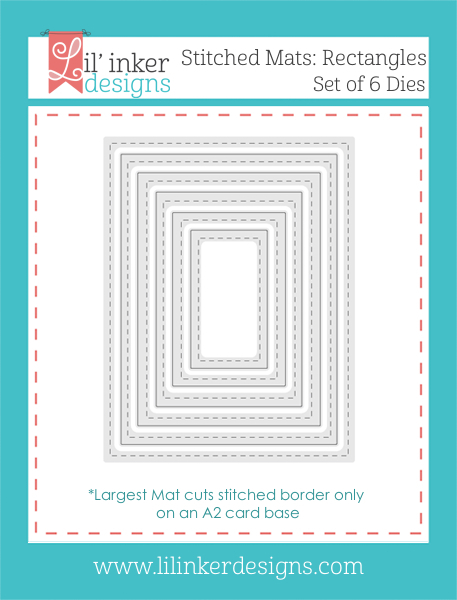 I die cut the foiled base with the Stitched Mats: Rectangles die. Then, I attached a piece of striped vellum to the front and secured the Today & Always sentiment on top. I finished it off with a gold silk ribbon. Thank you so much for visiting this week! Don't forget to leave a comment to win. All of the Lil' Inker products that I've used are linked above & are available at the Lil' Inker Designs store now! Your next stop on the hop is over to Jessica Frost-Ballas' blog. Welcome to day 2 of the Lil' Inker Designs Release! All of the products being shown today are currently available in the Lil' Inker Designs store! If you are following along in the blog hop you should have come from Heather Hoffman's blog. Be sure to leave a comment on each designer's blog to be eligible to win the big prize from Lil' Inker Designs this month! I have three cards to share today. 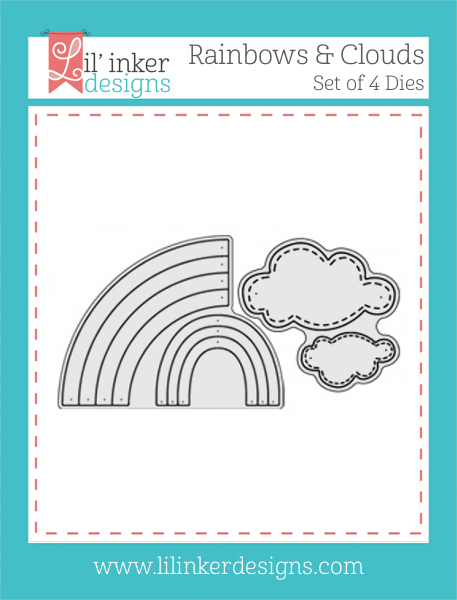 First up is another pink "rainbow" cardstock card. My focal image is made with a new die called Be Mine Greeting Die. 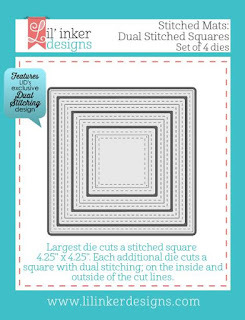 Once I cut out the Be Mine Heart, I then used a Stitched Mats: Dual Stitched Squares die to cut it out in a square shape. 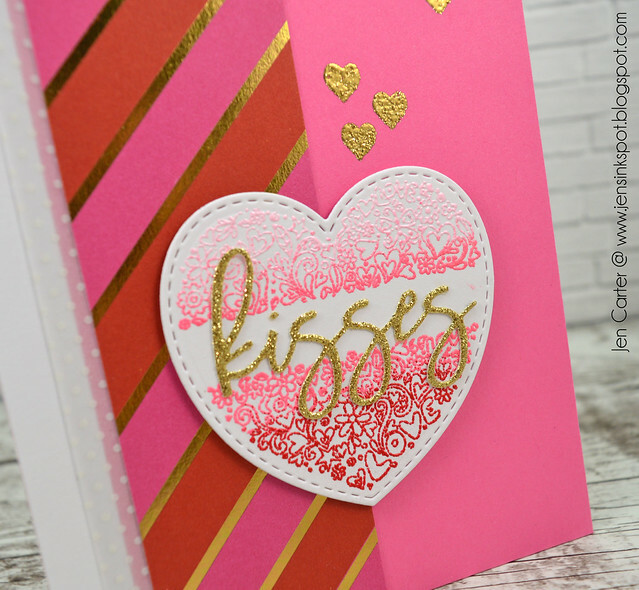 I backed it with stripes of Valentine colored cardstock and some chunky glitter. 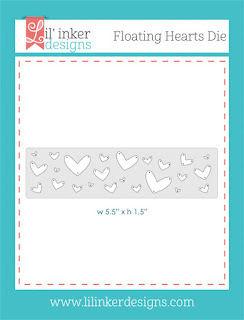 The background die with the hearts was made with the Floating Hearts die cut at an angle. This next card uses several new products as well. 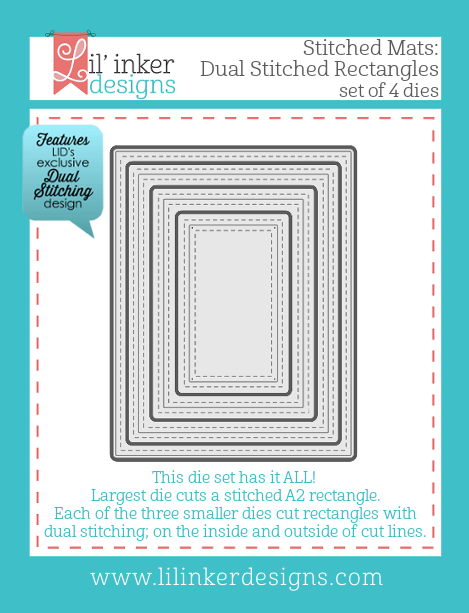 I started by die cutting the white heart with the new Dual Stitched Heart & Kisses Word Die Set. I stamped the inside image from the Filled Heart Stamp Set in VersaMark ink and then used 3 colors of embossing powder to give it that ombre look. 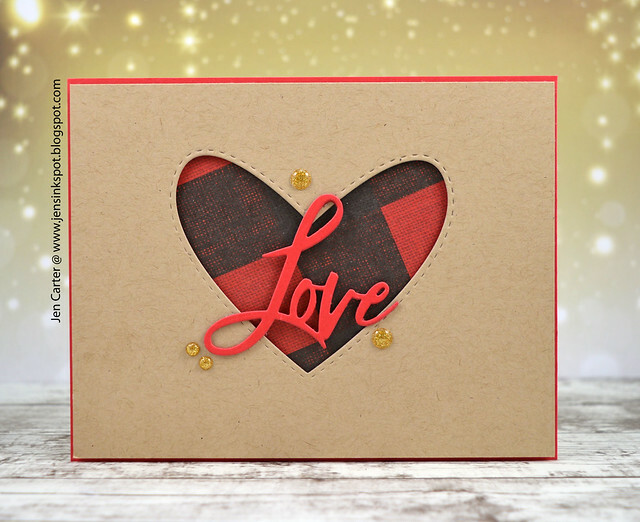 I embossed gold hearts that were stamped with the Love You More Stamp Set. Lastly I die cut the Kisses Word die from the Stitched Heart & Kisses Word Die Set in gold glitter cardstock. Last up is a mini card. 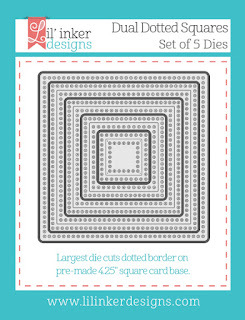 I die cut the background with a Dual Dotted Squares Die. 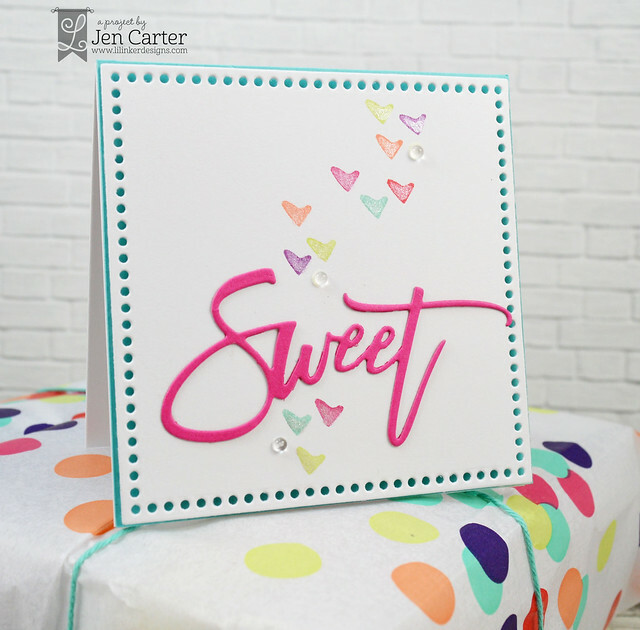 I then die cut the "Sweet" from the new Brush Script Valentine's Day Die Set. I love the font for this set! 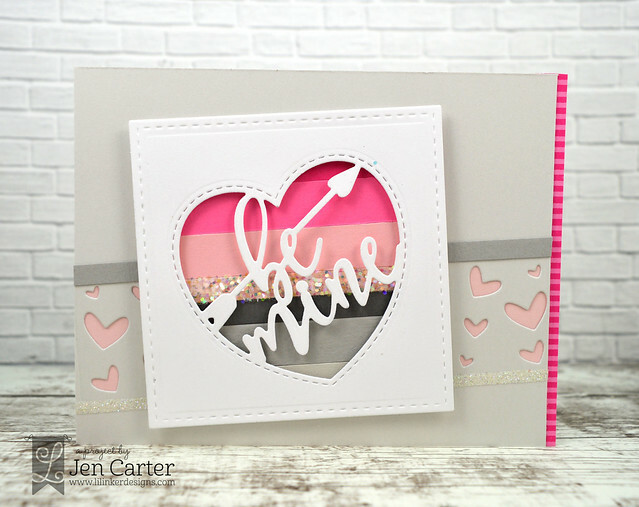 I stamped hearts in various ink colors using another heart from the Love You More Stamp Set. I then used Gansai Tambi Starry Colors watercolors to add a little shimmer to each heart. Thanks for visiting my blog today! All of the Lil' Inker products that I've used (and more!) are available to purchase right now in the Lil' Inker Designs store! Your next stop on the blog hop is over to Jessica Frost-Ballas' Blog. Hello! It's time for the Lil' Inker Designs release! The new products are already available in the Lil' Inker Designs store! If you are following along in the blog hop you should have come from Heather Hoffman's Blog! The prize for this release is another big one. You can win the entire release just by commenting on the Lil' Inker & Design Team's blogs! To be eligible you must leave a comment on each Design Team blog each day of the 3 day release. First up is my favorite card for this release. You'll start to see a theme over the next few days as for some reason I was really drawn to making rainbow colored items with paper scraps. 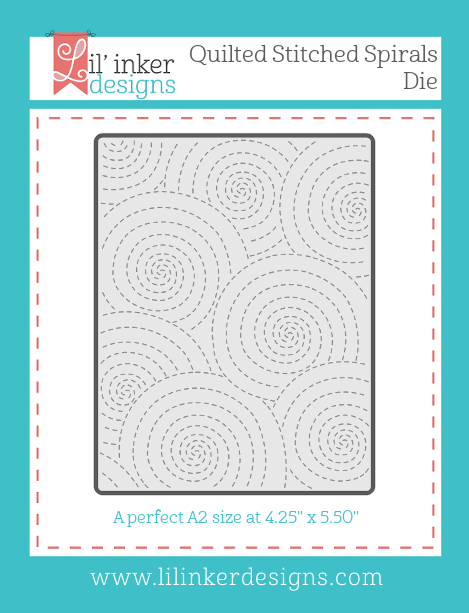 For this card I started by using the Quilted Stitched Spirals Die on the white background piece. 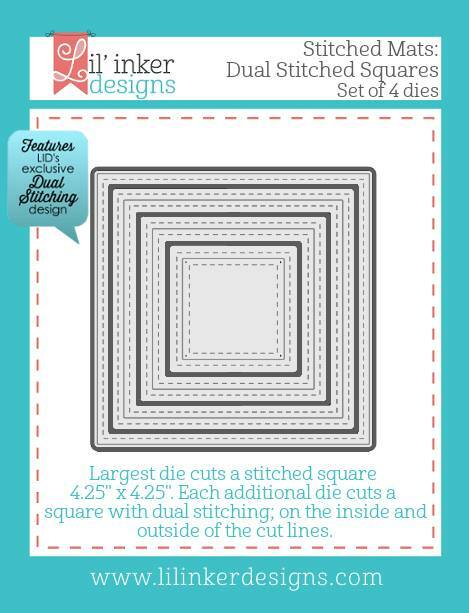 I then cut the gray matted layer with one of the Stitched Mats: Dual Stitched Rectangles dies. The sun is the Sunshine Die: Large die. 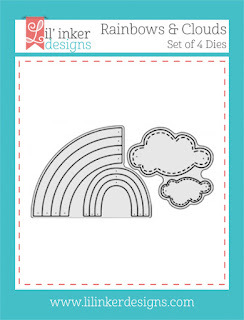 The stitched clouds are from the Rainbow & Clouds Die set. Now on to the new products I used on this card... 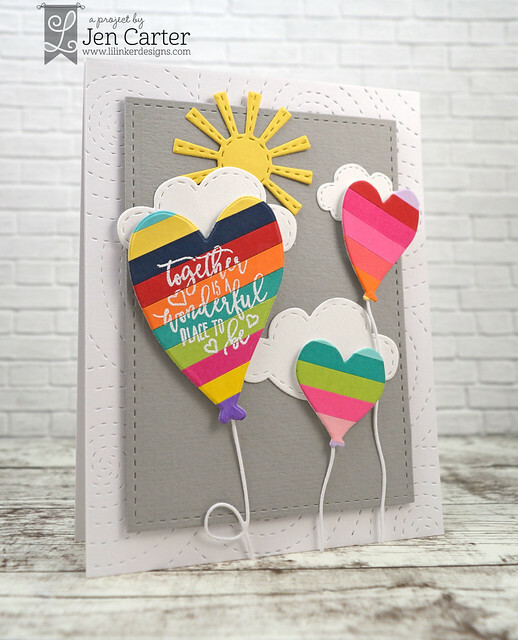 The FUN heart shaped balloons are from the new Love You More Hearts & Balloon die set. This die set includes heart dies & heart balloons. It also includes two thin balloon strings dies that I think are perfect! To create the various colors for the balloons, I cut thin strips of cardstock and layered them onto a scrap piece of white covered in adhesive and then die cut. 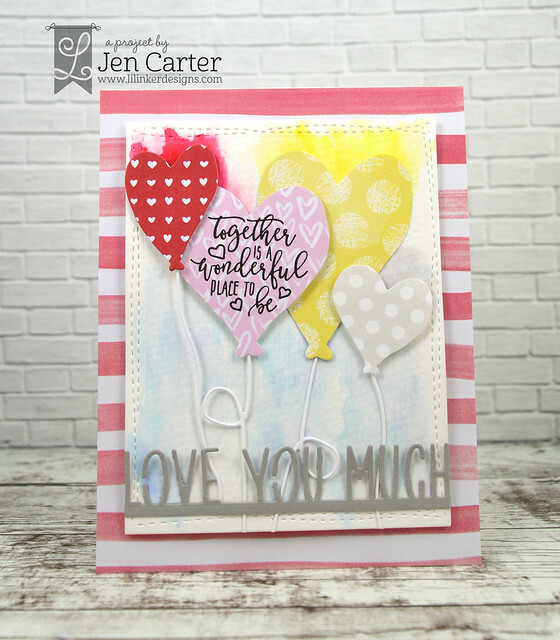 I embossed one of the sentiments from the coordinating Love You More Stamp set onto the the largest balloon. This next card uses a similar process to make rainbows that I used in the first card. I started by die cutting three of the Fringe Scalloped Heart dies into my white cardstock. I then layered a rainbow cardstock panel behind them and popped it up with dimensionals. I added the new Love You Much Border die at the bottom. I also used glue and some ultra fine glitter to add a strip of glitter to each heart. All products used on my card are shown & linked below. All of the Lil' Inker products that I've used (and more!) are available to purchase right now in the Lil' Inker Designs store! Your next stop on the blog hop is over to Jessica Ballas' blog! 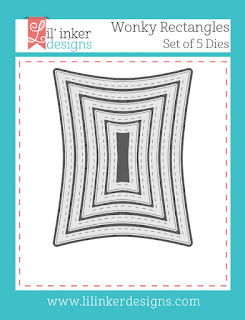 It's new release time over at Frantic Stamper and this month the release includes some wonderful new chevron edger dies! This card uses the Chevron Edger #2 (130 degree) die set. 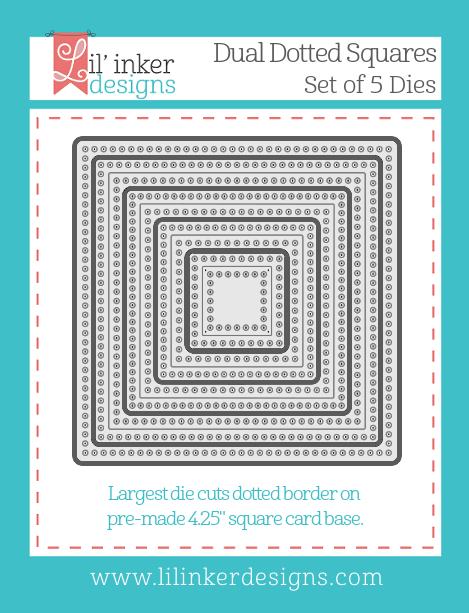 There are several ways to use this set but I wanted to use all three of the designs that it cuts on one card. I attached them at a funky angle on my card and kept it very simple. The big theme this month is pet focused and I used a sentiment from the new Dog Sentiments stamp set on this card. Here's a view from the front to give you a different perspective. I'm entering this in the Simon Says Stamp Wednesday Challenge to use something new. I've used new dies and stamps.